Beautiful and versatile, updos tend to be favored as bridal hairstyles – and not without reason. They can look gorgeous with a wide range of dress necklines, they are meant to emphasize the natural beauty of every face shape and they give an air of elegance and timelessness brides will always love. 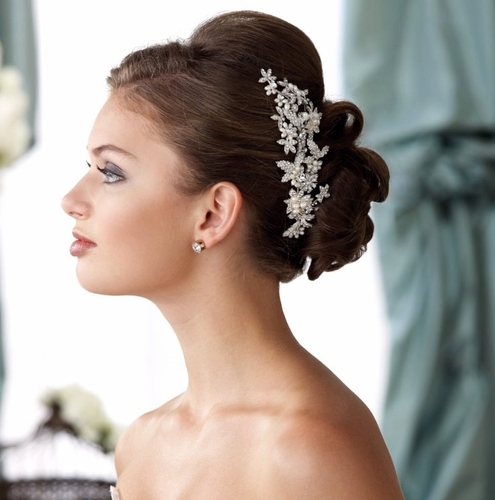 But what are some of the most gorgeous updo hairstyles for brides? We have gathered 5 of them right below – so read on if you need some inspiration. Asymmetrical twist. Are you an bride who wants her hairstyle to speak about an unconventional sense of fashion? Having your hair pulled in a gracious asymmetrical twist is a wonderful idea – and it will surely complement your entire wedding look. Plaited updo. Refined, elegant and really unique, a plaited updo is the perfect choice for a bride who wants just a dash of boho-chic to be brought into her wedding day. This style looks great with jeweled hairpieces, as well as “naked”. Classic French twist. There’s nothing more elegant than this updo – so if you want a formal, elegant and fairytale-inspired wedding, this is the kind of style that will surely suit you well. Looks gorgeous with jeweled hair accessories! Flowery updo. Want a very hippy accent for your bridal look? A braided updo with flower accessories or a flower crown will look stunning and unique – and it will surely wow everyone at the wedding! Ballerina bun. The classic high bun can look very elegant on brides – both with and without accessories. So, if you don’t want a very complicate hairstyle, but you still want to be elegant and glamorous, a ballerina bun will be perfect for you. Bella-Tiara has gathered an impressive collection of fabulous wedding hair accessories for you to choose from – so if you have decided on your hairstyle and are now searching for hairpieces to complement it, come visit us and you will not be disappointed! If you plan on having your wedding this spring, make sure you spend some time at the spa. This could be a wonderful gift for your mother or bridesmaids too – so there’s no need to go alone. Also, make sure you exfoliate your body at home too. Use a grainy scrub to get rid of the extra “winter skin”, use a pumice stone each time you get shower and remind yourself to get regular pedicures as well. Furthermore, remind yourself to clean out your makeup kit. Toss away all the products that may have expired and keep only those you know for sure that are still good. Don’t forget to clean your makeup brushes too and to invest in new makeup products for the season to come – and for the Big Day too! If you plan on having your wedding this summer, one of the most important things to take into consideration is UV protection. Invest in a high quality, oil-free UV protection moisturizer and in a high quality UV protection lip balm as well. Furthermore try to use waterproof and gel-based makeup products only (and especially on your wedding day). This way, you will not have to worry about having your makeup running all over your face. When it comes to the hairstyle, it is recommendable that you choose to pull your hair up. Not only will this look extremely elegant, but it will be very comfortable for you as well (especially considering the high temperatures outside). And if you are searching for gorgeous jewelry to accessorize your hair or your body, come visit Bella-Tiara! We hold an impressive collection of tiaras, headpieces and pieces of jewelry that will make you look drop-dead gorgeous!